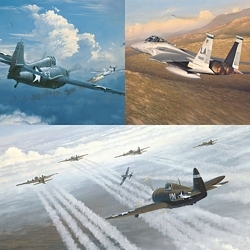 "A Time of Eagles" is a salute to the daring American pilots of the three "Eagle Squadrons" who earned the respect of their fellow RAF pilots and a special place in history. In all, 244 brave aviators flew the most maneuverable plane of the time ― the Spitfire ― with elite "Eagle Squadrons" of the RAF. Many became leading aces of the war, earning service honors from both England and America. When the United States entered the War on September 15, 1942, the men of "Eagle Squardrons" transferred into the American Air Force and became the 4th Fighter Group. "A Time of Eagles" portrays fighter pilot Oscar Coen as he soars through the clouds at sunset in his Spitfire. As one of the original members of "Eagle Squadron," Coen earned Britain's Distinguished Flying Cross and a French Cross of War as well as a Distinguished Flying Cross and a Silver Star from the United States Air Force. He is an ace, credited with 5.5 "kills." During his service, he was shot down once in France near the coastal town of Dunkirk. Looking back on his war years, Coen said: "There were as many reasons why we went to England as pilots. A lot of us saw the political ramifications of the war. We wanted to stop Hitler. But some of us were just adventurers. A lot of guys went because the British Spitfire was the hottest thing in the air and they wanted to fly it." For the collector or the historian, this Anniversary Edition Fine Art Canvas of "A Time of Eagles" delivers an epic portrayal of honor’s call in its highest sense. In capturing Coen’s achievement, Bill placed the craft in its element―the vast dome of moisture-laden air filled with billowing cumulus clouds and tinges with lateral streams of early morning light.